DIY How to Build a Generator Soundproof Enclosure. Generator Quiet Box! Blog DIY How to Build a Generator Soundproof Enclosure. Generator Quiet Box! 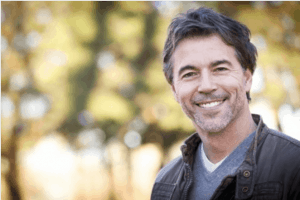 Do you have a generator or an air compressor that makes a lot of noise? Do you want to silence those appliances as much as possible? In this article, we will show you how to soundproof a generator or compressor by building a sound reduction quiet box. We made our sound reduction quiet box for a Champion 9500 Watt portable generator. Like most generators, aside from inverter generators, of course, they can become very loud. After building a quiet box, the noise level stands lower than the expensive Honda Inverter generators. You can also use this quiet box to silence an air compressor because the sound reduction techniques are the same. Building one of these generator sound reduction quiet box is more straightforward than most youtube video tutorial would lead you to believe. Don’t get me wrong, there are a lot of great youtube videos regarding DIY quiet boxes; But it doesn’t have to be that complicated. When designing the quiet generator box, there were seven primary criteria the quiet box had to have. The quiet generator box must decrease the generator noise by at least 50% or more. Surpassing the 50% noise reduction level can be achieved by following the instructions ahead in building your quiet box. Since the quiet generator box will only be used during extended power failures, it must be capable of being disassembled for storage in the minimum amount of space. The bottom of a small closet below the hanging clothes is the best location for us. The box must be quick and easy to assemble and disassemble without the use of screws. The mating surfaces of the parts must be airtight to prevent sound leakage. There must be air intake and output ports to allow sufficient cooling. The soundproof generator box must be able to run the generator in the carport out of the rain; And without anyone, including neighbors, being exposed to high amounts of carbon monoxide. The quiet box must be a modular design that allows flexibility to install different types of sound baffles and fans. The very first step you want to begin with is by measuring your generator or air compressor, whichever you want to build the quiet box for. You will need to leave a few inches on each side of the box to be able to handle the soundboard thickness, the insulation thickness, and the ventilation properties. By doing this, you minimize the risk of cutting the soundboard the wrong size. Measure the diameter of your ventilation ducts, and mark two circles on the MDX box to cut. The first ventilation duct has to be on the roof of your enclosure. Your top vent should be at the back and not in the center. Cut the second ventilation duct on a side piece that will be on the opposite side from the top duct. Lay the quiet box pieces out on your flat workspace with the four walls surrounding the top. The key to sound insulation is adding layers of free space that allows the sound to dissipate. The best way to deaden the sound inside a quiet generator box is by adding more than one layer of sound deadening material. 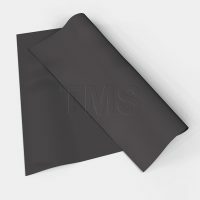 The first layer that you should add is made from a Vinyl MLV (Mass Loaded Vinyl) sound Barrier material. A sound barrier material made from vinyl is meant to block noise and used for soundproofing, unlike a foam which is a sound absorber. The MLV sound barrier we used to build the soundproof generator enclosure is the “TMS Mass Loaded Vinyl 4′ X 4′ – 16 Square Feet 1 Lb MLV Acoustic Sound Barrier”. Click here for current Amazon price. Even if the sound barrier material you use on the inside of the enclosure has glue on it, it wouldn’t be a bad idea to add some “Greenglue noise-proofing compound.” You will also need some Greenglue noise-proofing sealant (Amazon Link) to seal the edges of the vinyl. To learn more about the GreenGlue products, CLICK HERE to be redirected to our Greenglue tutorial and product review. We will explain why we always use GreenGlue and why it’s our favorite soundproofing sealants. 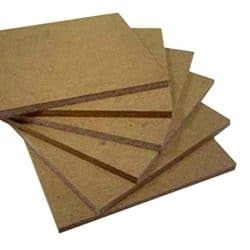 Foam matting made of closed cell vinyl nitrile will be ideal as the second layer of soundproofing. I could not find the exact type of foam matting I wanted on Amazon, so I ended up supporting my local hardware store. You should be able to see what you need at your local hardware store also. Again, cut it to size and glue it directly to the vinyl layer, caulking the edges with GreenGlue once more to complete your soundproofing insulation. 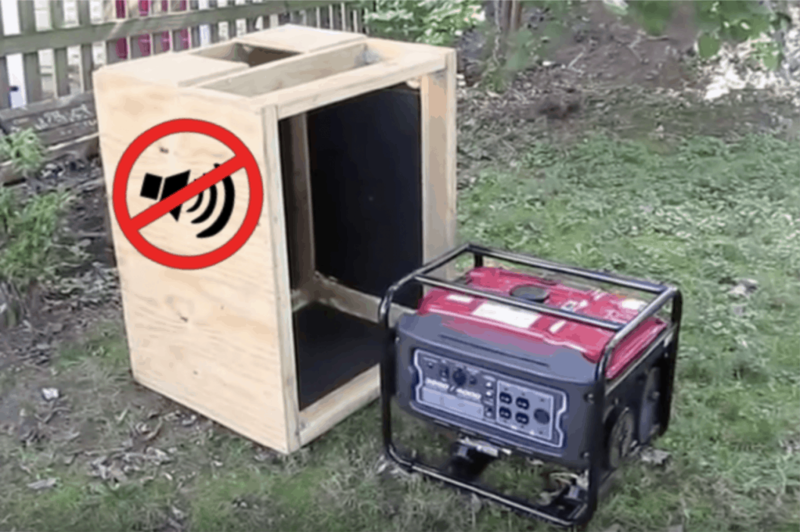 It’s time to assemble your DIY generator quiet enclosure finally! One by one, attach all four walls using nails or screws. I always use screws in case I want to modify the quiet enclosure in the future or merely disassemble it for space saving needs. Lastly, attach the top of the enclosure and securely screw it down. Tip: If you opt for a design with a hinged top for easier removal of a smaller generator, the vents will have to be installed differently, as the hoses will present an obstacle. It is imperative to supply air and proper ventilation to the inside of your DIY generator quiet box. The generator will need adequate ventilation to properly function and to avoid overheating. Combustion is impossible without air, and a lack of air will cause the generator to overheat to potentially dangerous levels. When venting exhaust from a soundproof generator box, use venting ducts with lots of bends in them; since sound waves travel in a linear path, bending and curving will cause the sound to lessen. Thread the hoses into the holes you cut earlier and then secure them in place. A small vent should be placed over these openings as well. Building your DIY soundproof box for your generator is a lot cheaper than buying a professionally made soundproof quiet box. I hope you found this article of great use in your DIY efforts. Please let us know in the comment section below if you completed your quiet box and what are your impressions. Also, let us know if you built the box differently and how it works. Hi I live offgrid and use a generator for a prolonged time. Would this be safe? It would be, the only thing you need to look at is how much heat is emitted from the generator and if the box is sufficiently expunging the heat into the atmosphere. You can certainly make some modifications to the box if it gets too hot.